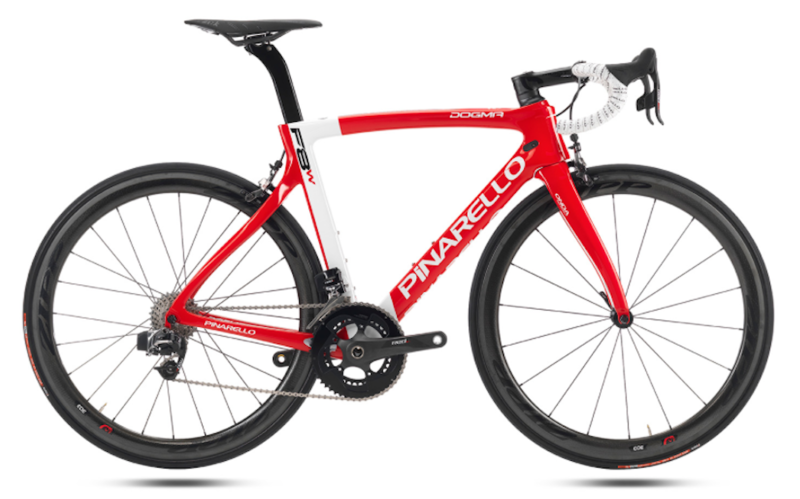 Pinarello has announced details of its 2016 bike range, which includes a new version of the Dogma. Called the Dogma F8W (for wireless), the new model features SRAM’s Red eTap wireless groupset. A long time in coming, eTap is now finally trickling out onto 2016 bike ranges, with Boardman Bikes announcing a couple of weeks ago a version of its Air aerodynamic bike equipped with the new groupset. SRAM Red eTap dispenses with wires to connect the shifters to the derailleurs, with signals transmitted wirelessly. The shifters contain transmitters which are powered by coin cells, while the derailleurs have their own batteries which attach to the back of the units and are user-swappable if the power runs low. A departure from all other groupsets, eTap handles the front and rear changes itself, with one shifter controlling upshifts and the other downshifts. When the front mech needs to be operated to get the correct higher or lower gear, the groupset itself decides to make the change. Apart from the shifting, the Dogma F8W remains the same as the company’s previous models. The aerodynamic frame and its distinctive asymmetric design were developed in partnership with Jaguar – which provided aerodynamics and computational fluid dynamics, and Team Sky which provided feedback from its athletes. The ports for the derailleur cables are still present on the F8W but are blanked off. 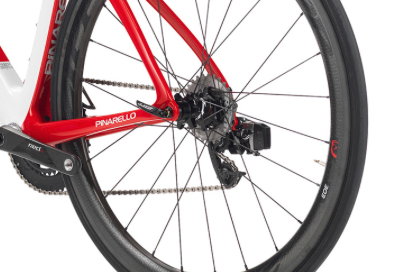 The specing of a SRAM groupset represents a departure for Pinarello, whose top-end bikes have usually been specified with Shimano Dura-Ace. Indeed, Shimano has recently announced the professional teams which will be using its products during the 2016 and 2017 seasons, which will include Team Sky. The price of the F8W has not been announced, but with the Dura-Ace versions hovering around £10,000, don’t expect any change from your ten grand.